This is a quality backpack sprayer used by professionals. Four-gallon capacity, padded shoulder straps and an adjustable nozzle make it a perfect choice for applying aquatic or lawn products. 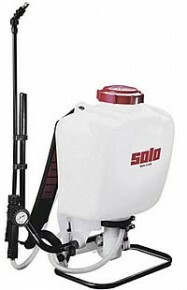 We strongly recommend this durable “diaphragm pump” sprayer versus piston type sprayers. Once you use a backpack sprayer you will never use a carry around tank sprayer again. No more constant bending and refilling. Also great for lawn fertilizer, herbicide and mosquito control applications. Save on Quantity Orders! Call for Bulk Quotes.